Auscript has once again shown its support for the future of the legal profession, as a Gold sponsor of Women Lawyers Association of Queensland (WLAQ) Annual Awards Night held last week. WLAQ President Cassandra Heilbronn commended Auscript for its commitment to the event for the second year in a row. “It is great to have Auscript supporting women in the profession, and it certainly sets a great standard for their employees, particularly the law students that they have on staff,” Ms Heilbronn said. The WLAQ 38th Annual Awards were held at the Hilton Hotel in Brisbane on Friday 21 October 2016, to acknowledge the achievement and dedication of women in the industry. Each year, the WLAQ recognises the achievement of women in Queensland’s legal profession with their Annual Awards. Ms Heilbronn highlighted the event’s ability to bring people from all areas of the legal profession together to support the future of the industry. “It is important that the legal profession comes together as a whole for events such as our Awards Dinner. This includes firms, organisations and businesses as we all play a role in working towards gender equality in the profession,” she said. 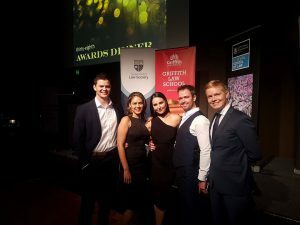 Auscript General Manager Kate Gaske noted the importance of supporting the lawyers of today and the future, through Auscript’s involvement in events such as the WLAQ awards. “This year’s record attendance also included a number of Auscript employees who are currently completing their Law degree,” Ms Gaske said. It was a great night, and Auscript looks forward to supporting next year’s event. Photo: Auscript Service Desk Team Leader Craig McKenzie, HR Business Partner Caryn van Niekerk, Annotations Officer Tekan Cochrane, Senior Systems Engineer Kriss Milne and Annotations Officer Shane Montgomery at the 2016 WLAQ Awards.